Hello Monday, you sad sop of a beast. Okay, actually Monday isn't that bad, but why isn't the weekend longer? It's like one of those falling dreams, that always seems to happen just as you're dozing off, and your body reacts and jaunts you awake. I just want another few minutes of nap, Monday, just wait a few more hours for the work week to begin again. This past weekend wasn't car free at all, which I missed badly. No long bike rides. I spent Friday night with my sister at the bookstore (and left with Lena Corwin's new book as well as a Sarah Vowell book on the super-clearance table for $3! ), then Saturday morning at the Farmer's Market, talking food with anyone who'd lend an ear. I went home with a bag of yellow peaches, Bosky Acres Chevre (that tastes a lot like cream cheese--it's my newest addiction, so so good), fresh eggs, and garlic. Not a whole lot, but all of it is 100% flavor. 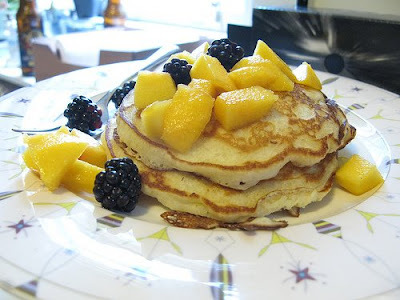 A little cooking, including biscuits stuffed with a honey/chevre filling and Sunday morning pancakes smothered in fresh fruit from the wild blueberry patch down the street and peaches from the farmer's market. A little computer time, adding to W&tS one of what will be a series of pinhole images Hi-C took with his growing collection of homemade pinhole cameras. It's amazing to watch the process--so foreign and fascinating to me. This article, via please sir, is a perfect pairing with my Modish post on Friday. Is it a reaction to modern events such as the war in Iraq and Al Gore's popular movie? As of tomorrow, my 11 year old credit card* will be paid off, after an extensive battle with a 24.9% finance rate. Yes, folks, you read that right. My interest was actually that high. 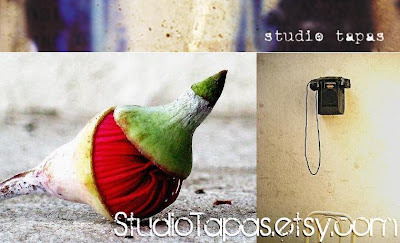 I also just noticed one of my flickr contacts now has an etsy shop. She's partnered up with her friend Vicki, and they opened their art photography shop last week. Go check it out--her eye for color and texture is amazing, and I love that they're offering larger sizes, too! You'll love the timelessness of each piece, I promise! *This was a card I signed up for because the store I was working for had a MasterCard promotion, and the corporate owners pressured the managers to have a certain percentage of customers sign up for the card. Obviously not many people go for that gimmick, so all of us employees signed up for them. At 19, it was my "new clothes fund". I have used it less than 5 times in the past 5 years--if that gives you any inkling of what a battle it has been for me. In celebration of the financial freedom I will gain tomorrow, there will be giveaways! 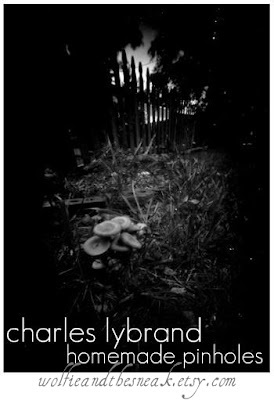 i love that mushroom print and featured it on my blog today. your work is beautiful!